Former Iranian President Mohammad Khatami has officially announced his withdrawal from the country's presidential election in June. In a statement, he said he would pull out in order not to split the reformist vote. Two other pro-reform candidates are also in the running. Mr Khatami was president of Iran from 1997-2005 and was succeeded by Mahmoud Ahmadinejad, a hard-line conservative. Mr Ahmadinejad is widely expected to stand for re-election. 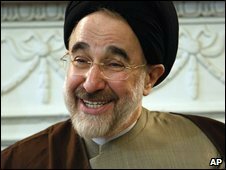 It was not immediately clear if Mr Khatami meant to endorse one of the other candidates. Early reports that he was quitting the race suggested he would back former Prime Minister Mir Hossein Mousavi. "I announce my withdrawal from the 10th presidential election," Mr Khatami said in a statement released after a late-evening meeting with his supporters and campaign officials. He called for a "free and fair election". His withdrawal leaves Mr Ahmadinejad in a stronger position despite heavy criticism of his management of the economy, the BBC's Jon Leyne reports from Tehran. Mr Khatami was one of the country's most liberal president since the Islamic Revolution in 1979. But he entered this campaign reluctantly and unenthusiastically, adds our correspondent, and it soon became clear that many of those in power in Iran did not want him to return as president. One city prevented him from campaigning with the excuse that it would cause traffic jams. 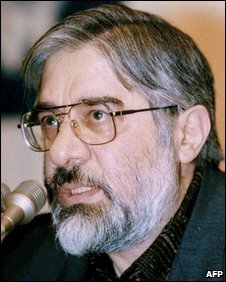 One of his rivals, Mr Mousavi, held office between 1980 and 1988. He is also a member of Iran's Expediency Council, which is the country's top political arbitration body. The other pro-reform candidate in the race is Mahdi Karroubi, a former parliamentary speaker.